I’ve seen so many fancy recipes to make jam, with all kinds of ingredients and complicated instructions, but I never managed to find a ‘basic’ recipe for a good, decent, easy jam, which I could use for different fruits and then our friend Carina came along and shared her wonderful jam recipe! Here, Carina has made Apricot and Strawberry Jams which she has harvested from her garden. Sure looks wonderful! Recipe by Carina Duclos and various sources, see end of recipe for further details. 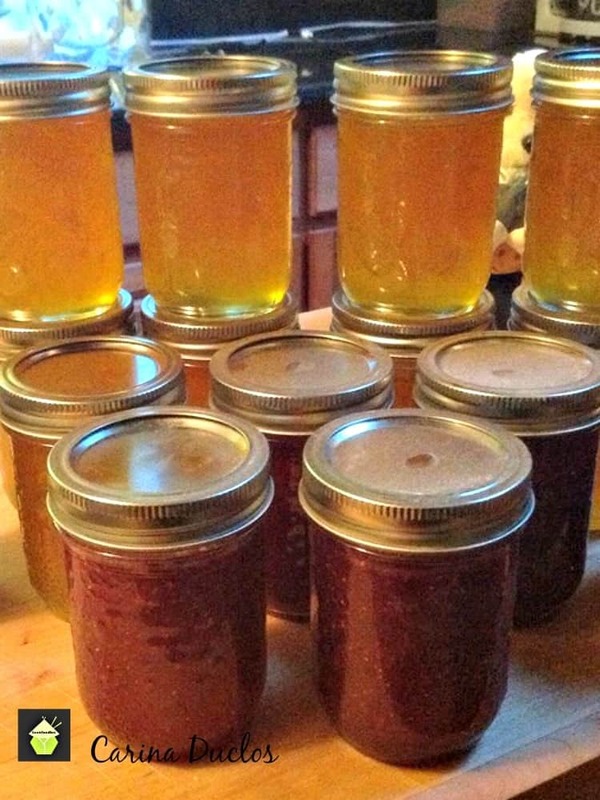 5 cups / 600 g of fruit – In this case, Carina made Apricot and Strawberry Jam. **** Please note,You can use any fruits, just stick to the same ratio of fruit to sugar. 1. In a large, deep stainless steel pot stir fruit, sugar, lemon juice and butter. Over high heat, bring mixture to a full rolling boil that cannot be stirred down. At that point add liquid pectin, squeezing entire contents from pouch. Return to boil; boil hard 1 minute, stirring constantly. Remove from heat and skim off foam. Tip: the butter is to reduce foaming and that really makes a difference. Tried it both ways and enforce that! 2. Fill the hot boiled jars with the hot jam. 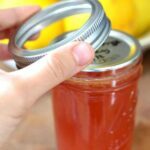 Leave a space of about 1/4 inch (0.5 cm) of top of jar. Wipe jar rim removing any food residue. Centre hot sealing disc on clean jar rim. Screw band down. Place jars back in the canner (boiling pot). Ensure that all jars are covered by at least one inch (2.5 cm) of water. Cover canner and bring water to full rolling boil before starting to count processing time. At altitudes up to 1000 ft (305 m), process – boil filled jars – 10 minutes. 3. When processing time is complete, turn stove off, remove canner lid, wait 5 minutes, then remove jars without tilting and place them upright on a protected work surface. Cool upright, undisturbed 24 hours; DO NOT RETIGHTEN screw bands. 4. After cooling check jar seals. Sealed discs curve downward and do not move when pressed. Remove screw bands; wipe and dry bands and jars. 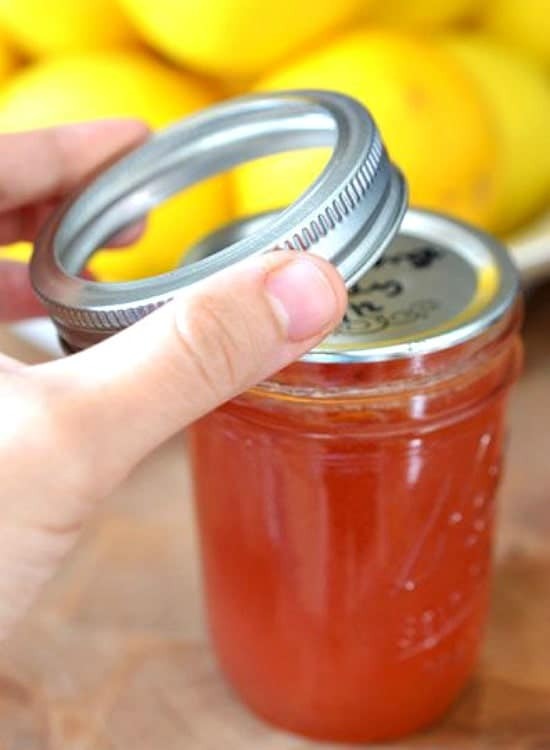 Store screw bands separately or replace loosely on jars, as desired. Label and store jars in a cool, dark place. For best quality, use home canned foods within one year. 5 cups / 600 g of fruit - In this case Carina made Apricot and Strawberry Jam. In a large, deep stainless steel pot stir fruit, sugar, lemon juice and butter. Over high heat, bring mixture to a full rolling boil that cannot be stirred down. At that point add liquid pectin, squeezing entire contents from pouch. Return to boil; boil hard 1 minute, stirring constantly. Remove from heat and skim off foam. Fill the hot boiled jars with the hot jam. 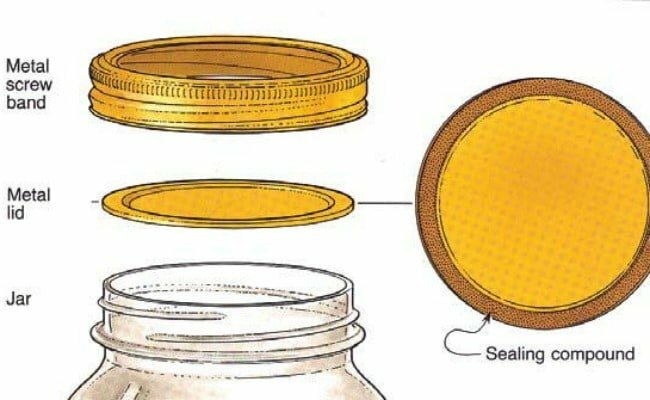 Leave a space of about 1/4 inch (0.5 cm) of top of jar. 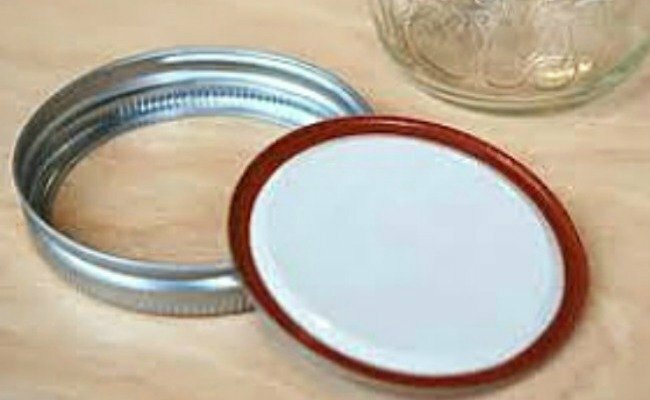 Wipe jar rim removing any food residue. Centre hot sealing disc on clean jar rim. Screw band down. Place jars back in the canner (boiling pot). Ensure that all jars are covered by at least one inch (2.5 cm) of water. Cover canner and bring water to full rolling boil before starting to count processing time. At altitudes up to 1000 ft (305 m), process – boil filled jars – 10 minutes. When making diabetic jam I use splenda but then add gelatin to thicken it . Still experimenting with this. Some times I use diabetic jello along with the plain gelatin. Thanks for your tips Linda! That’s very good to know! Where dose the lemon juice come in ? I David, yes, sorry it should be in step 1. I have corrected so it reads clearer. Thank you so much for asking. how would i make this jam diabetic friendly, as i am diabetic? what would the stevia or splenda equivelant be? Hi Trudy, I’m afraid I don’t know the answer to making this diabetic friendly, is there a Diabetic chart or website you could go to in order to seek advice on suitable substitutes for recipes to make them suit your needs? You call for butter in step 1 but it’s not o the ingredient list. How much do I use? Ji jennifer, thanks for raising that! It is 1 Tablespoon of butter. I’ve just amended the recipe so it shows. thanks so much for asking 🙂 Enjoy your jam! Thanks 🙂 I will be trying it this weekend! !